In our modern world, where communication is omnipresent via social media, texting, and online forums, it is a novelty to find a method of communication that goes beyond words on a screen. Amar Bakshi was shaped by his experience with a grandmother whom he maintained a relationship through an electronic medium, and his long bus rides back to law school during which he struck up conversations with random strangers to pass the time. However, Amar felt as if the same devices that keep us connected to our friends and family were restricting us socially. Social media outlets like facebook and communication apps like skype encourage conversations with the same people, and limit experiences with new people. It is with this revelation that Amar created Portals. What began “as a daydream” now has over 20 locations all over the globe. 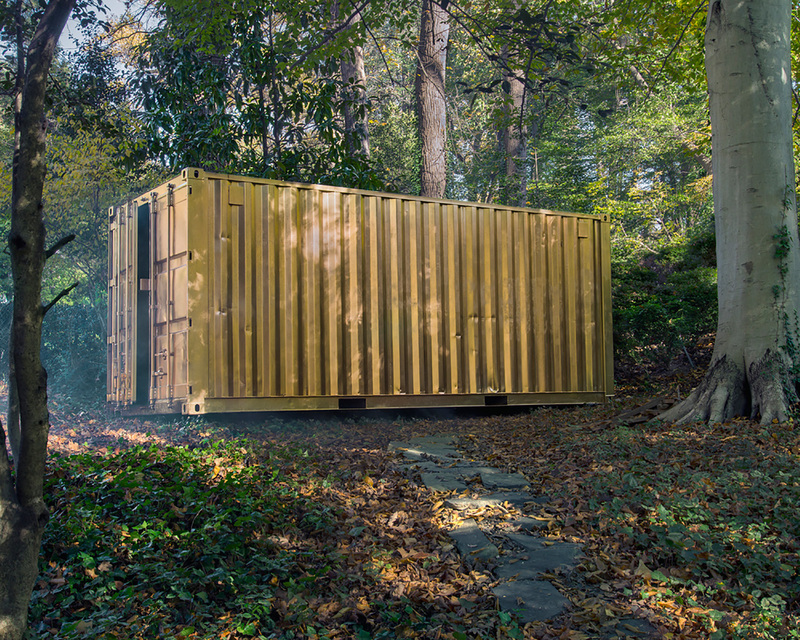 Amar’s “Portals” are gold-covered shipping containers and tents that look like they belong in The Fifth Element. 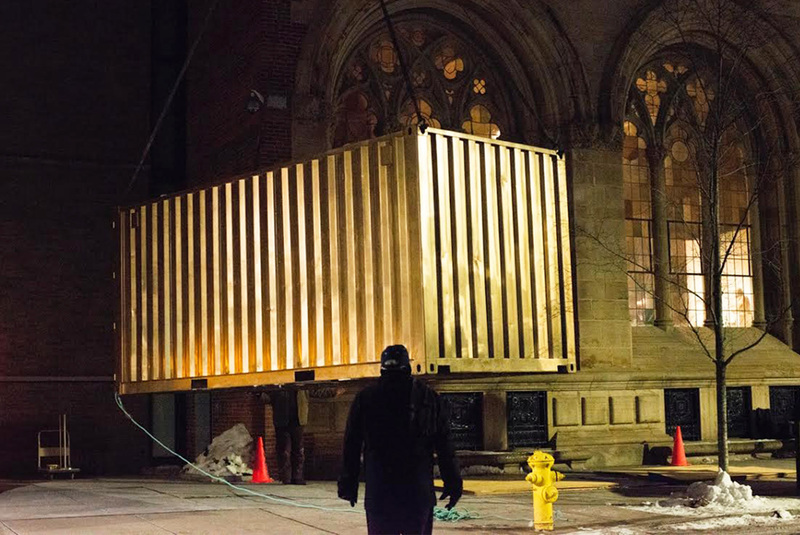 Within the containers are darkened rooms that allow the participants to have face-to-face conversations with another Portal across the world. The climate-controlled environments have been optimized for these conversations, with high-definition cameras allowing the immersive experience to provide the most realistic projection of the other Portal. Participants may talk for however long they desire, as long as the other Portal is willing to comply. The Portals, originally intended solely for conservation, have become home to intimate concerts, family reunions, and moving displays of dance. Amar “expected the Portals experience to be neat, unexpected – maybe cool. But we were surprised to find it had such an emotional effect.” Amar and his team regularly have to pull participants out after conversations run longer than two hours. Portals are staffed by a full-time “Portal Curator” who help participants with translation, interpretation, engaging the broader community, and organization of special events. These Portals have an element of privacy and anonymity that is lost in today’s world. Amar explains “Cell phones don’t work in the Portal. Nothing is live-tweeted. Participants are unlikely to see their counterpart abroad again, so whatever they say is not likely to make its way back to friends at home. Third, the conversations felt relatively natural. Instead of talking to a disembodied head on a computer screen, participants spoke to a full, standing human being – fidgeting and swaying – and made direct eye contact, unencumbered by goggles or headphones.” These intimate and privatized experiences lead to more wholesome and engaged conversations that have led to the Portals becoming a international fascination. Southwest of Sri Lanka, in the Indian Ocean, lie the Maldives, a land of blue lagoons and soft white sands, where coral islands form ring-like atolls. Formerly known as “King’s Island”, it is here, stretching across four miles of secluded coastline, that you will find the all-villa destination, One&Only Reethi Rah. A place awash in shades of teal and indigo with a sunlit sky, and comprised exclusively of villas, guests of Reethi Rah are sure to sit back and soak up the incredible surroundings. And for those looking for a little adventure, opportunity abounds. North Malé Atoll is alive with possibilities for those who wish to explore a little further afield. Day trips off the island include traditional hand line fishing aboard a Maldivian dhoni, luxury cruising aboard a privately chartered yacht, island picnics on a perfectly secluded sandbank, epicurean cruising with champagne, seaplane flights or big game fishing to try catching yellow fin tuna, wahoo, and marlin. From fishing charters to luxury yacht cruises, the Maldives is a water-lover’s paradise. Learn the fine art of harmonising tastes and textures in the utter luxury of the new One&Only Reethi Rah culinary school. Available in a range of culinary styles from around the world such as Maldivian, Chinese, Italian, Indian, Arabian, Japanese ‘Washoku’, Thai, and French; classes taught under the expert tutelage of master chefs provide guests with the opportunity to learn the delicate nuances of food presentation and world cuisine. The experience starts with a guided visit to the Chef’s Garden where the culinary team will demonstrate how to select the finest and freshest products while guests hand pick organic ingredients for their chosen course. Upon return to the culinary school, One&Only Reeti Rah’s master chef will guide pupils through an epicurean selection of the finest cooking products, helping guests prepare exquisite dishes with expert guidance. One&Only Spa provides bespoke retreats to ensure that your stay on the island uplifts, revives and restores you. The consultants blend holistic and conventional expertise to create individualised programs combining the spa treatments and fitness activities in line with nutritional intake, creating focused spa regimens to inspire lifestyle change and well-being. With programs ranging from 3 to 7 days, all of the ‘Reset in Residence’ Wellness Journeys begin with a personal lifestyle, fitness and nutrition consultation and target specific goal orientated journeys, such as weight loss or anti-stress. Surrounded by the crystal blue wonders of the Indian Ocean, this ultra-luxury all-villa resort in the Maldives offers an unrivalled level of style, choice and personalised exploration. Sleek and spectacular, with unprecedented privacy, One&Only Reethi Rah offers the ultimate holiday experience to those seeking the pinnacle of tropical luxury. Rome is the home of legends, religions, and a storied, war-torn, and majestic past. Palazzo Dama wishes to share its own regal history with the glory of the ancient city, and by doing so has become a beautiful destination hotel for the discerning, elite clientele of the world. Experience Rome as one of the oldest families of nobility, the Malaspina family, did for over a century. 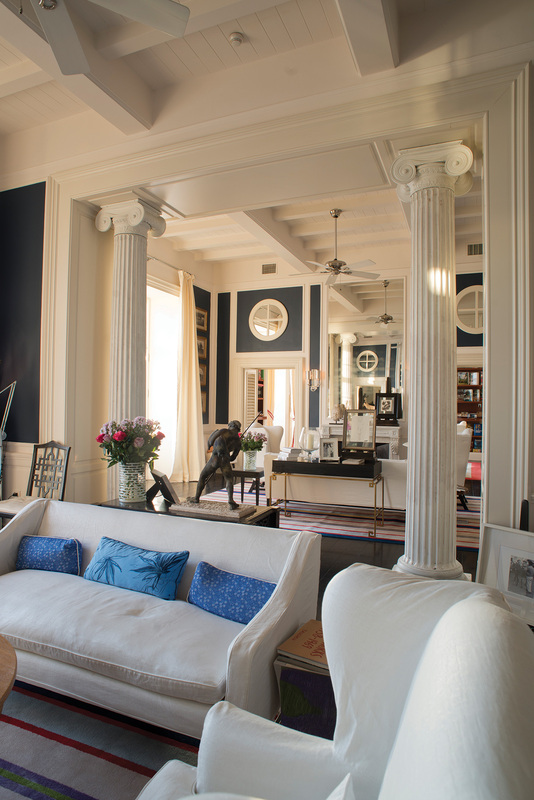 The Palazzo Dama is situated near the banks of the Tiber River, and has been host to countless aristocrats, diplomats, and other prominent social and political figures for generations—it is alway a pleasure to stay in Rome feeling like a noble. Named in honor of the dignified elegance of an aristocratic woman, or dama in Italian, this estate offers beautifully decorated rooms, sweeping views of the surrounding area, and a ma- jestic, full-service villa. The hotel was constructed mere steps from the Piazza del Po- polo, where guests have the freedom to pick from numerous events and destinations in the capital city. Designed by the famed architect Antonio Girardi, thirty sun-drenched rooms and suites make up the luxurious and historic vacationing experience. The garden of Palazzo Dama is filled with native lemon and olive trees which fill the air with scents of the Italian country. Located in the garden is a beautiful, pristine pool elegantly carved out from the earth. Guests can be seen lounging around the area and taking a swim in the waters as the naiads of myth did. On the rooftop, a private terrace provides stunning views from the Tiber to the Vatican and on across the glorious cityscape of Rome’s terracotta rooftops and ruins. The hotel itself was made to feel like a luxurious private home, as if you were arriving at your own villa. Original marble mosaics be- deck the entrance, alongside stunningly de- tailed Art Nouveau doors which open to the lobby, hall, and lounges. 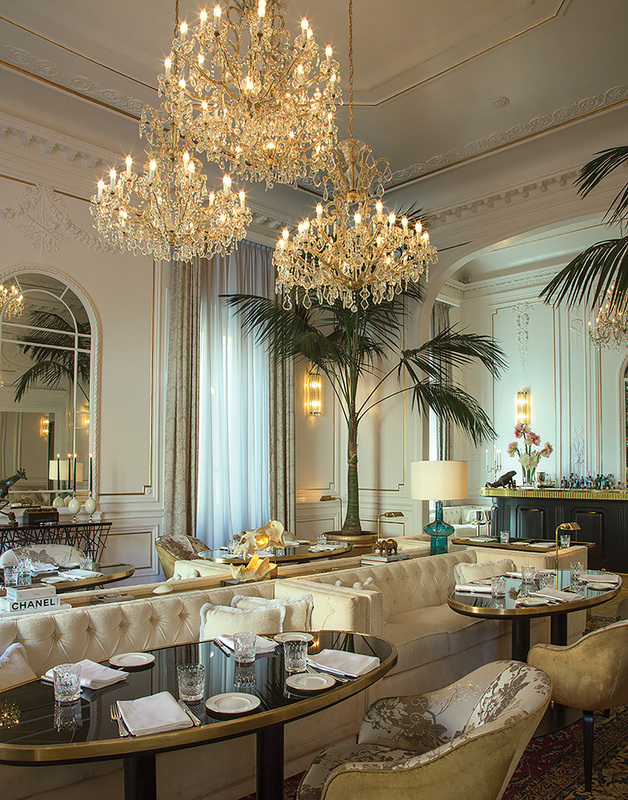 The ceilings of the communal areas of the hotel are spotted with crystal chandeliers sourced from New York’s iconic Plaza Hotel, along with vintage Venini glass fixtures. A gracefully carved grand wooden staircase sits stately at the center of the palazzo, and is lit by turn-of-the-century beveled glass mirrors reflecting the natural lighting of the space.The furniture, hand-crafted by artisans and designed by the ho- tel’s architect, was carefully selected to enhance the already palatial hotel. Once you have arrived to your suite in the Eternal City, enjoy a meal at the L’Autre Dame which offers gourmet, fresh, health-conscious dishes and a menu of international and local fare, with a kitchen open to guests twenty-four hours a day. The cocktail bar, situated in a beautiful deep blue alcove, is a great go-to evening spot, but the subterranean nightclub located below will be the perfect end to your day in Rome. Dance the night away and enjoy the hotel’s signature cocktails during your Italian vacation. In the morning, spend the day exploring the city with customizable tours, or perhaps spend the afternoon pampering yourself with exclusive beauty and wellness treatments in the comfort of your own suite. 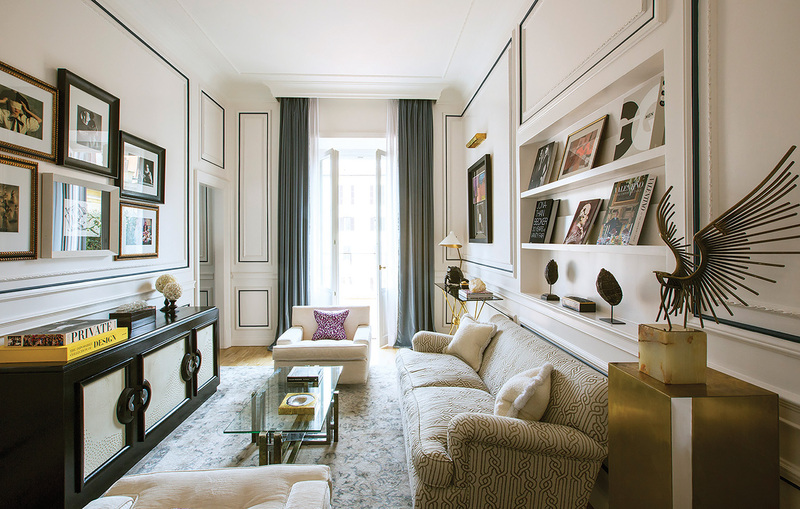 The suites have been designed to create an atmosphere of comfort, with vintage artistic objects from international collections, coffee table books filled with art, photography, and culture, and a collection of iconic photographs by world-renowned photographers. The high ceilings of each suite highlight the airiness of the rooms which have been painted in a rich but soothing palette of dark blues and aquatic greens that echo the design elements of the hotel, along with the surrounding Tiber River. To complete the sensorial and visual experience, Diptyque candles and beauty products fill each room with botanical scents in order to transport each guest to bliss. 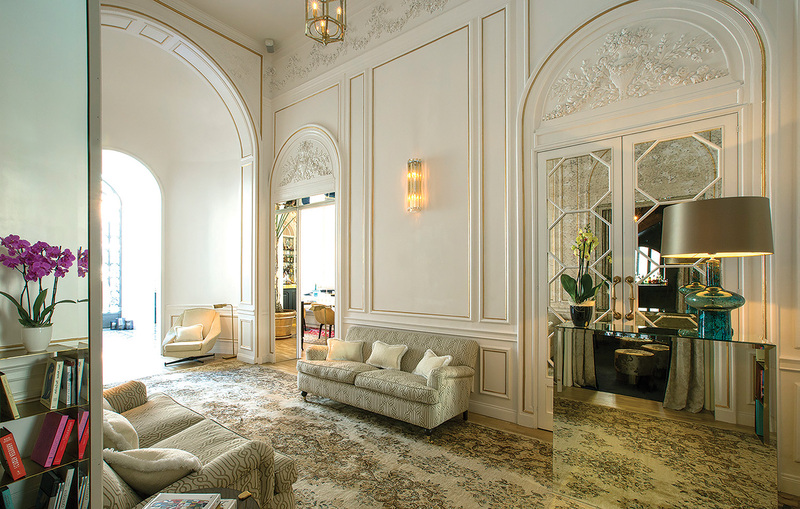 The Palazzo Dama offers a unique opportunity to exist as a member of nobility once again, and is one of the premiere hospitality destinations for Italian luxury travel. Come to the ancient city and luxuriate in the paradise of Palazzo Dama as if you were a Roman empress of old. Inside the beautiful cerulean waters of the Indian Ocean lies a rarified gem which offers paradise and escape from our usual urban culture. The unique environment of the island has created an immaculate habitat for all sorts of life, however, human-kind is the one species which has taken a backseat in participation. People are now invited to protect the ecosystem and help it thrive, while enjoying exclusive, private, eco-friendly accommodations. 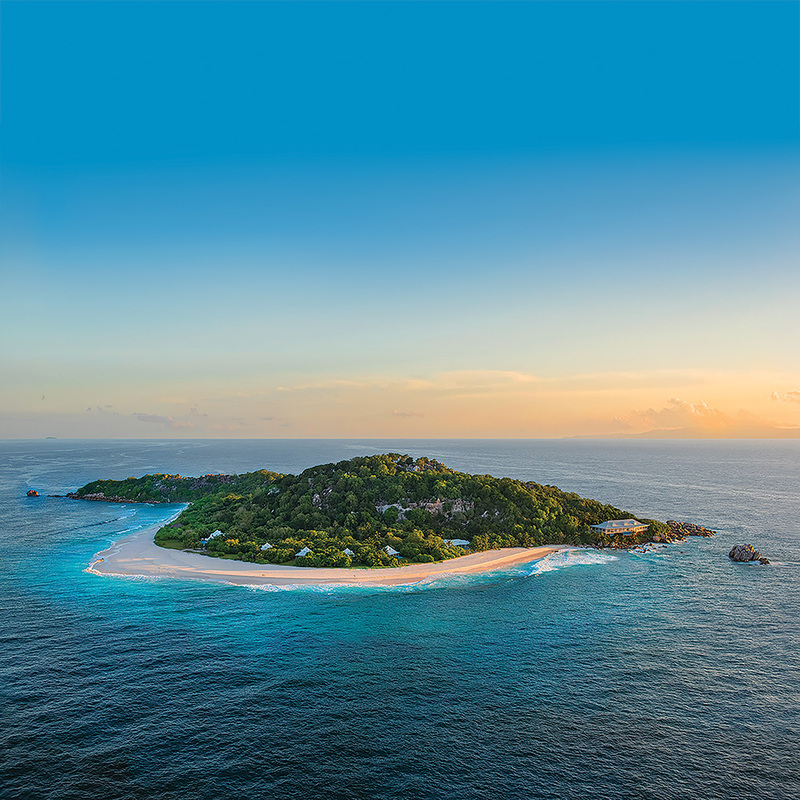 Cousine Island is one of the least touched or changed granitic islands of the Seychelles archipelago and is internationally famous for being an extremely ecologically important, privately owned island. 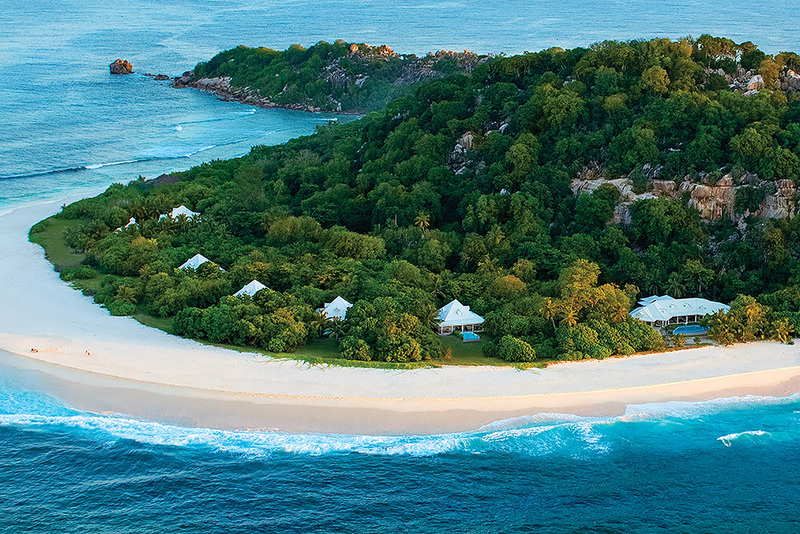 Reopened in April 2016, Cousine Island offers a rare natural experience without sacrificing truly unparalleled luxury and mindfulness of our impact on the world around us. On the island there is a sensation of seclusion and privacy that we almost never have in our largely urban lifestyles. You too can become a part of pristine nature and live, not as an intruder, but as a guest at one of mother nature’s most stunning creations. 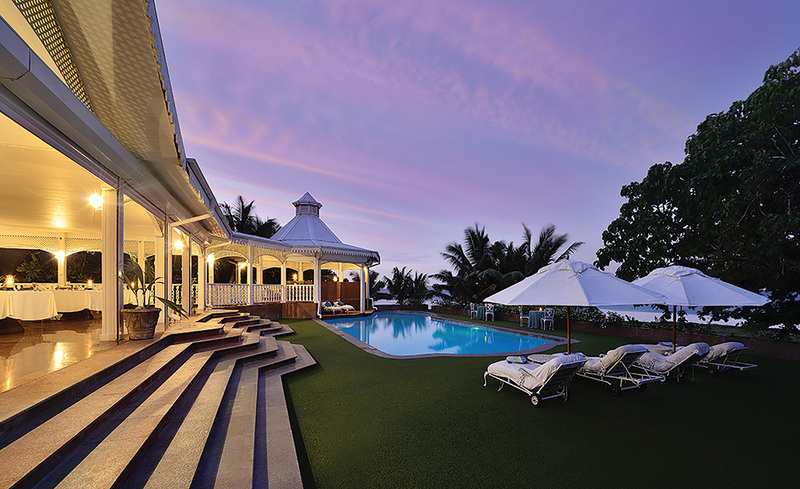 Cousine Island has four beautifully designed French colonial luxury villas and one impressive Presidential villa which offers two master bedrooms with en-suite bathrooms, a study area, personal gym, spa, kitchen, dining room, and outside bar and living space. All five of these villas are surrounded by lush, vibrant, local flora and are just a stone’s throw from the beach. Each villa is specially designed with handmade furniture as well as the most innovative technology to ensure each guest is living in luxury and comfort. The island offers an option for a full-time butler and accommodation for a private au pair for families with small children who wish to enjoy the beauty of the island sanctuary without worrying over their little ones. No expense has been spared to ensure the happiness of each guest. On this vacation getaway expect to have a gastronomical experience that will leave you enchanted by the chef extraordinaire’s ability to craft delectable dishes filled with color and aromas inspired by Creole, Asian, and Western cuisine. There is no menu, but instead the chef discusses each meal with the guest to ensure a bespoke eat- ing experience which is custom made to ensure satisfaction. All of the ingredients in the haute cuisine meals are sourced locally or from Cousine Islands’ garden supply of fruit trees, herbs and vegetables. Fresh fish is caught locally and sustainably by fisherman on Praslin and Mahé Island. Capri cannot help but conjure up images of Greta Garbo and Marlon Brando cavorting around the island in chic cropped trousers and sandals, and still the tiny, rocky island contains that same reputation of glamorous beauty. In the summer, upwards to 20,000 visitors can be caught on the island touring and shopping each day. However, it is the crowds that stay on the island once the ferries leave to dine and promenade after the sun sets that are the ones to watch. Some of these glamorous people are guests at the world-renowned J.K. Place Hotel. 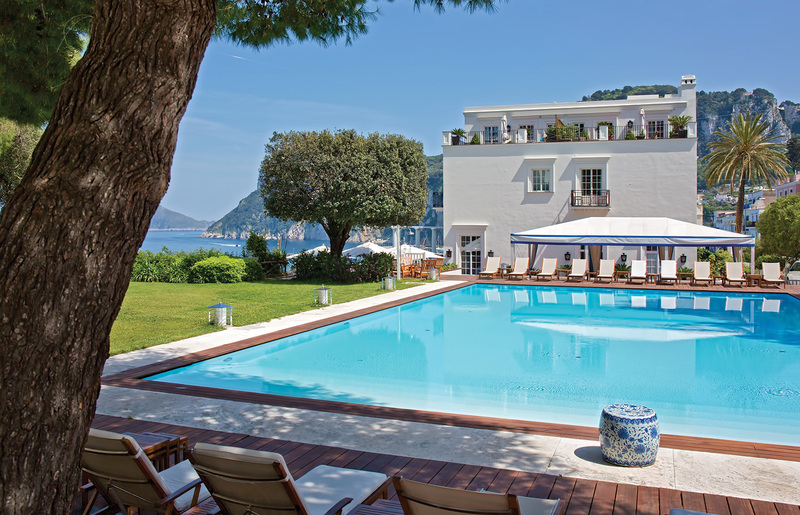 The luxury of discreet sophistication and taste make the J.K. Place Hotel a location where comfort and wellbeing are combined with an enviable panoramic position and setting in the luxuriant Amalfi coastline. The venue possesses an under- stated charm and elegance which offers the comfort of the hearth while surrounded by precious details of subtle luxury. 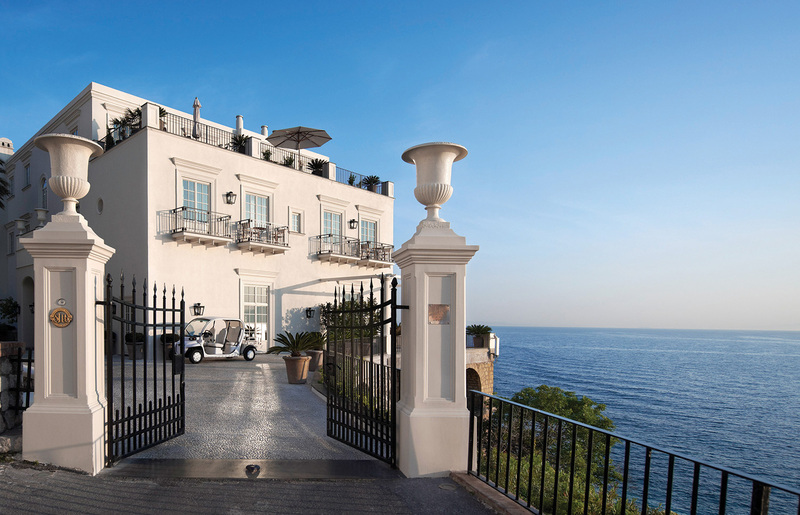 With twenty-two spacious rooms designed with the artful revival of classical style in mind, the concept of the resort is that of a luxury house that amplifies the light, color, and breathtaking beauty of the sea. The airy curtains let light spill onto the white stone floors, highlighting the picturesque views of the Capri coastlines. The rooms also offer large windows and panoramic views so guests may really immerse themselves in the opulent setting. The stylish touches of mosaic and stone , elegant black and white furnishings, and other premium decor highlight the casual beauty of the space. How- ever, the great beauty of the space with equally superb service. The guests are coddled by warm and friendly care that starts once you arrive and continues on until you may just mistake yourself for an empress or pampered courtesan. The hotel offers a splendid pathway that spirals down into the ocean so guests may enjoy the azure waters off the wind- swept cliffs. The building overlooks the Marina Grande beach, near the Amalfi Coast, and provides guests with ample space for sunbathing and enjoying the salty Mediterranean waters. 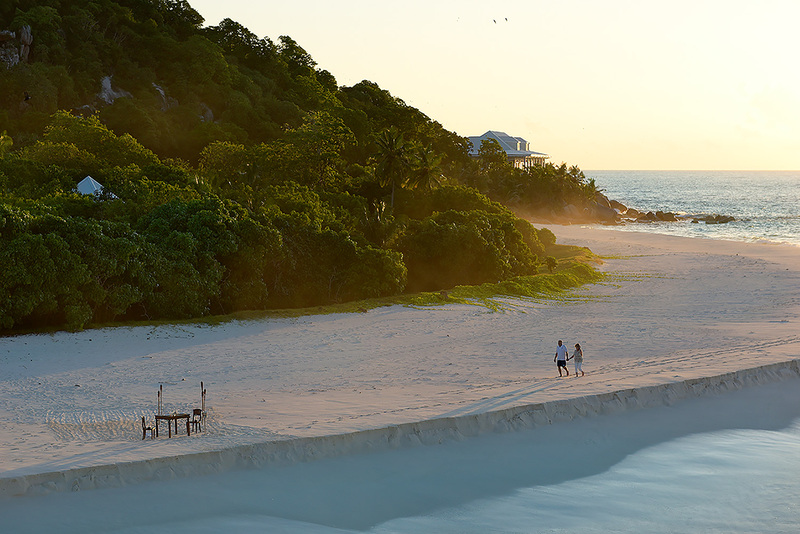 After you lounge on the white sands of Marina Grande, you can head up to the JK Spa for a relaxing sauna or massage. The spa of J.K. Place is what every spa should aspire to be. Stocked with products from the famed Santa Maria Novella brand, it is easy to lose yourself in a lavender scented haze and shea butter lotions. Or perhaps get in a workout at the premium JK gym be- fore heading out to dinner. J.K. Place is just steps away from the port, and the characteristic “Funicolare” railway transports visitors from Marina Grande to the Piazzetta, pulsating heart of the island, in just three minutes for one-of-a-kind dining and shopping experiences. J.K. Place also offers its guests unforgettable excursions and mini vacations towards the most enchanting locations of the Blue Island and Amalfi Coast, night excursions to watch the sunset, and tours around the island to discover all of the natural wonders that the area has to offer. Between Mexico’s Sierra Madre Mountains and the Pacific Ocean, and surrounded by lush, tropical forests lies Capella Ixtapa, a secluded, romantic and exclusive resort whose location is so private it’s like sharing a well-kept secret. Set alongside a stunning rock cliff with endless views of the breathtaking azure blue ocean, Capella Ixtapa offers its guests a hide- away setting that belies the wealth of attractions just minutes away. Ixtapa-Zihuatanejo is nestled on the Pacific Coast 140 miles north of Acapulco and is part of the “triangulo del sol,” or triangle of the sun, of the Guerrero state in the southern meridional region of Mexico. The Nahauatl dialect word ‘Ixtapa’ means “the white place” in reference to the pristine white sands of the area. Once a coconut plantation close to the quaint fishing village of Zihuatanejo, Ixtapa is now an intimately modern, environmentally-friendly resort area ideal for travelers who prefer small, secluded destinations to bustling cities and major destinations. Ixtapa-Zihuatanejo continues to impress with its natural attributes – from sandy beaches and rugged mountains to exuberant vegetation – setting the stage for some of the finest sport fishing, golf and eco-sports available anywhere. Additionally, the protected waters surrounding Capella Ixtapa are home to a variety of sea life and vegetation. 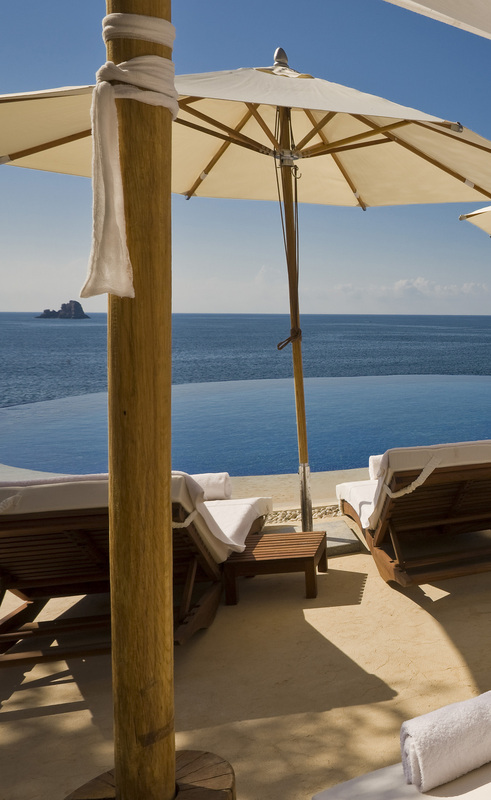 From the moment you arrive at this luxury Zihuatanejo resort, you will be immersed in the Capella experience. 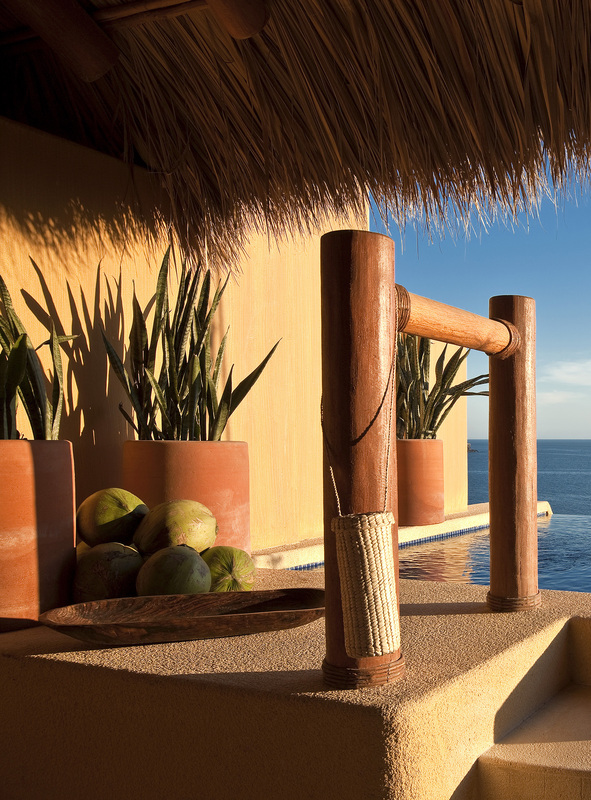 An open- air reception area and soothing, warm Pacific breezes welcome you as you transition into your extraordinary, adventure-filled vacation at Capella Ixtapa. 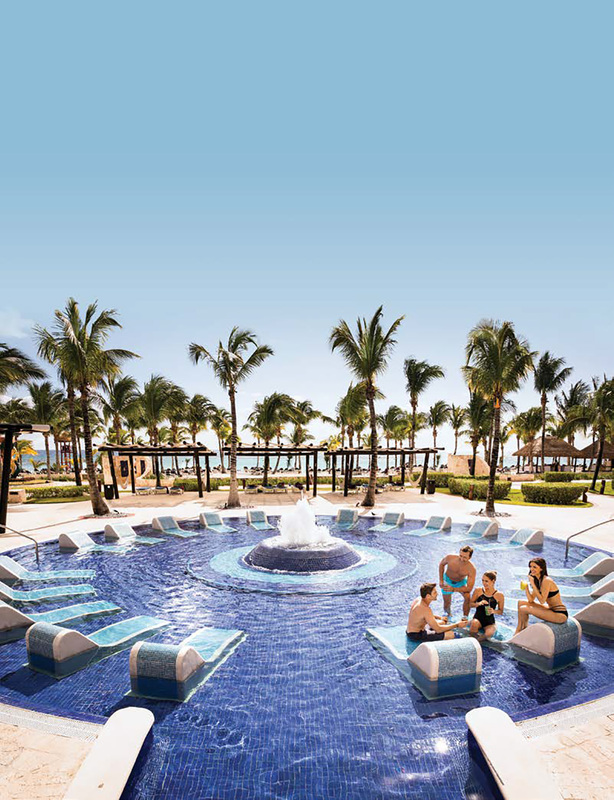 The resort’s design celebrates Mexican culture with a sophisticated blend of modern and traditional design elements. The wonderful intermingling of modern and traditional Mexican touches of textured handmade clay and stone meeting sleek marble and polished hardwoods are seen throughout the resort. This method of construction, honoring the vast heritage of our locale in a cosmopolitan way, has become a Capella Resort trademark. 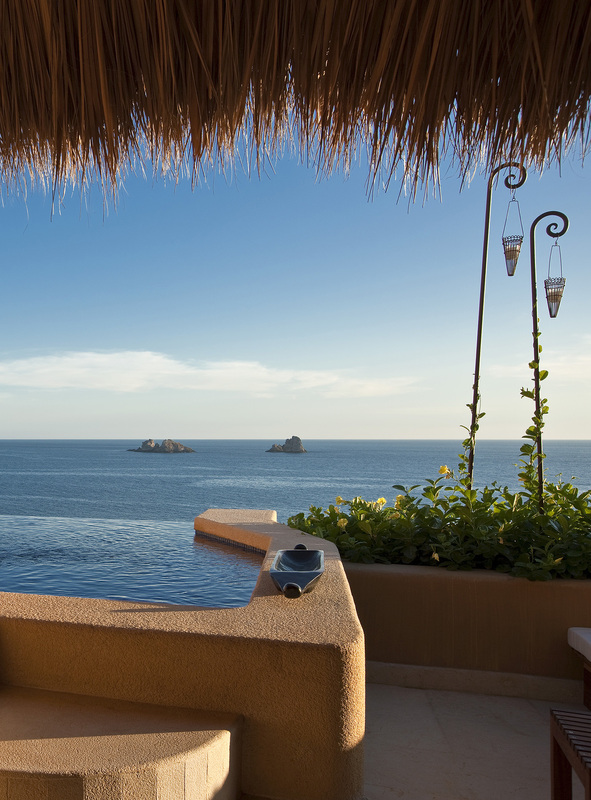 Capella Ixtapa extends over Don Juan beach, a small stretch of the Pacific coastline, and offers guests the utmost privacy in a stunning environment. Each of the 59 guestrooms and suites cascade down a cliff towards the sea, boasting breathtaking views of the Pacific Ocean, where stunning rock cliff landscapes meet crashing waves. 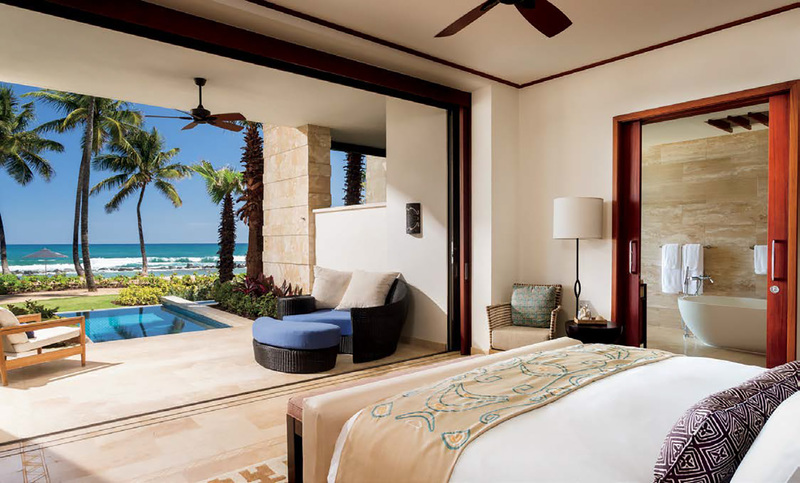 Each guestroom and suite features a large, private outdoor terrace and an individual plunge pool thoughtfully positioned out of sight from other suites to en- sure privacy. The moment they arrive, guests will feel enveloped in luxury and care, as if they have been warmly welcomed to the estate of a close friend. The Capella experience transcends that of the most luxurious hotel avail- able today, with an array of well-thought- out amenities and intuitive services. 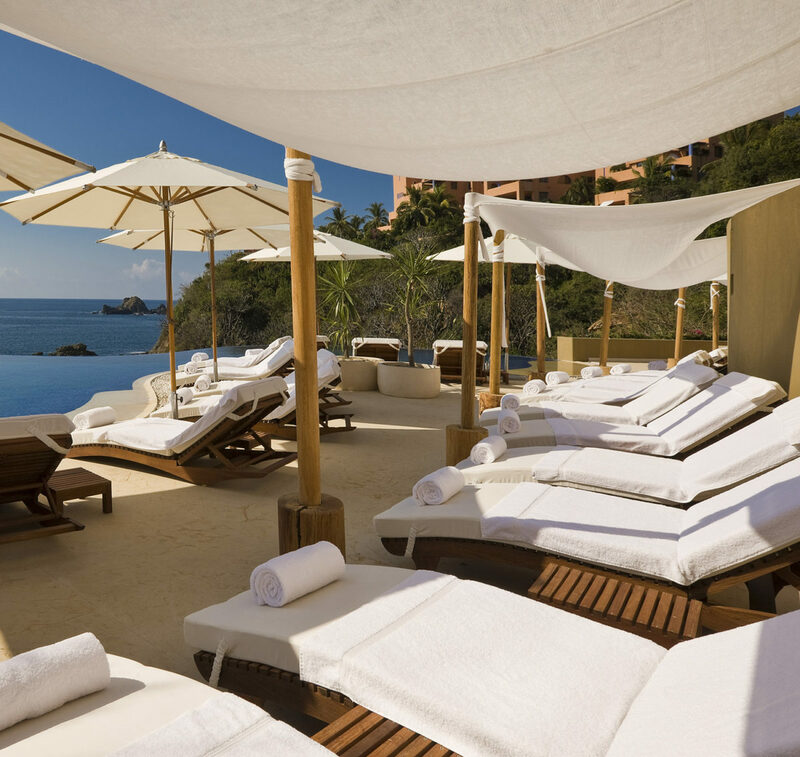 The Spa at Capella Ixtapa, which is the region’s only spa, wellness and fitness facility, featuring 6,000-square- feet of interior space overlooking the Pacific Ocean. In addition, peaceful, exotic outside treatment environments provide the ultimate in pamper- ing and rejuvenation. Each guest is treated to a traditional foot cleanse after being escorted to one of six indoor treatment rooms or the outdoor massage area. In addition to a wide selection of beauty treatments, massages and therapies, a yoga and Pilates deck and fitness area is located at the top of the resort, providing spectacular Pacific Ocean views. Guests may also choose to dine in the privacy of their own private terrace through the resort’s 24-hour room service, or arrange for a special romantic dinner experience at a unique location on the hotel’s grounds. This private world of splendor is paired with unparalleled luxury, where crowds are left miles away. The luxury five-star retreat of Capella Ixtapa allows guests to get away from it all while revealing a bounty of unsurpassed beauty. Somewhere between idyllic and perfection sits a Puerto Rico resort of such intimate luxury and rare character, it calls to those who believe every journey should be a voyage of discovery. Once a 1,400-acre sugar plantation owned by the Livingston family, Dorado Beach caught the eye of conservationist visionary Laurance S. Rockefeller, who in the 1950s transformed the lush landscape into one of Puerto Rico’s most exclusive luxury resorts. 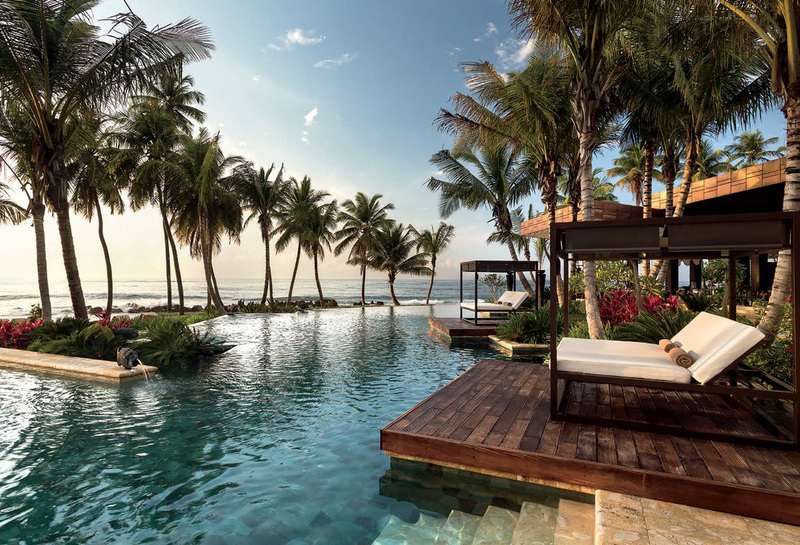 An exquisite sanctuary tucked away on the Puerto Rico Caribbean coast, Dorado Beach, a Ritz-Carlton Reserve is one of those special secluded resorts where time not only stands still, it is replete with extraordinary moments. At this private Puerto Rico resort, serenity and casual luxury are intertwined as guests become immersed into their indigenous surroundings – a 50-acre island retreat encircled by coral reefs, blue Caribbean waters and a lush tropical forest. Both new and timeless experiences answer the desire for discovery. This secluded Puerto Rico resort compliments a bespectacled travel experience with a deep- er level of service. The attentive and discreet Embajadores will always be available for any request you have throughout your stay. Fundamental to Dorado Beach is a passionate environmental philosophy originally instilled by Laurance Rockefeller. The de- sign and infrastructure of the secluded re- sort reflects Dorado Beach’s remarkable surroundings with a myriad of natural elements incorporated throughout. Situated on Puerto Rico’s Caribbean coast, yet worlds away from typical luxury beach resorts, Dorado Beach is an intimate retreat offering a true sense of barefoot elegance among unspoiled views and towering palm trees. Blending Rockefeller’s novel environmental design philosophies and modern, yet minimal décor, this Dorado Beach resort blurs the boundaries between outside and in, creating an open-air enclave that embraces the natural splendor and diverse culture of an unspoiled corner of the world. From the dedicated butler appointed to create an experience tailored to your needs, to the indulgent spas, dining experiences and adventurous recreational opportunities, Dorado Beach is a true luxury sanctuary designed to allure the world’s most discerning travelers. Few homes at Dorado Beach are held with such reverence as Su Casa, which served as Clara Livingston’s beloved residence from 1928 – 1955. One of Miss Livingston’s conditions was that no alterations would be made to Su Casa until the last Livingston was deceased. Now at the VIP villa for Dorado Beach, guests can experience the original Spanish hacienda restored to its original 1920s grandeur. This expansive 8,000-square-foot, five-bedroom villa, complete with a private concierge embajador, extraordinary oceanfront views and a private infinity-edge pool, is nestled among the resort’s palm-fringed beaches and tranquil ocean waters. With acclaimed chef José Andrés at the helm of his first Caribbean restaurant, Mi Casa, guests can enjoy an epicurean ad- venture that reflects Puerto Rico’s heritage as the crossroads of Spanish, Caribbean and American cuisine. From outdoor dining on the shores of the Atlantic Ocean, experience a savory blend of delectable flavors, innovative dishes prepared by a culinary mastermind and a refreshing blend of fresh handcrafted cocktails prepared with many ingredients from the resorts own gardens. Tucked away amid lush flora is Spa Botánico, a five-acre botanical sanctuary of pampering offering a holistic yet modern approach to beauty and wellness. This relaxing enclave blends lush surroundings, a soothing natural environment and the finest quality of local botanicals and ingredients to enhance tranquility and revitalize the senses. From the Apothecary Portal that welcomes you into this relaxing realm, to the gar- dens that produce the healing properties of many of our indigenous treatments, Spa Botánico coaxes each of your senses into a heightened state of focus.